A young actor puffing thoughtfully on a pipe during the opening scene of a play usually means one of two things: a production modelled on the revue style of the ubiquitous Cambridge Footlights or a period piece that sits awkwardly in the 21st Century. Mercifully, last night’s performance of Look Back in Anger didn’t succumb to either of these two possibilities. Thanks to the combined talents of Manchester-based Blackhand Productions, the incongruity of a 20-something youth sucking on a pipe never threatened to descend into cliche. Nevertheless, it must be daunting to take on John Osborne’s ground-breaking masterpiece. Tempting, too, to place the original kitchen-sink drama in its rightful era of the post-war, post-empire 1950s. But this edited version of the controversial classic rooted its harsh and filthy realism very much in the present. Osborne wrote his bitter polemic more than half a century ago, but director Helen Parry’s production felt like a play for today. That’s not to say the period detail wasn’t present. From the physicality of the 1950s evinced by shabby wooden furniture and old-fashioned newspapers to Jimmy Porter’s rages against the public and private inertia of mid 20th Century Britain, Osborne’s world was real and raw. But none of this seemed to matter. The social and political relevancy of Look Back in Anger hummed in every monologue, argument and quiet moment. Perhaps the genius of Osborne’s play is its mystery. There are so many difficult questions. Why does Alison, a girl from a comfortable, upper middle-class family, marry Jimmy, a working class firebrand who loathes the upper echelons of society and has no qualms in blaming his wife for all of its shortcomings? And genial, placid Cliff. Why does he stay with this warring couple, watching Jimmy gnaw at Alison’s self-worth yet doing little to separate them? And then there is snooty, lip-curling Helena who usurps her friend’s place as Jimmy’s lover. Any portrayal of Jimmy, the original angry young man, draws inevitable comparisons with Richard Burton who, although criticised for being the wrong age in the film of the play, produced what many consider to be an unbeatable performance. Another Welshman – a then unknown Michael Sheen - delivered an epic interpretation of the role at Manchester’s Royal Exchange in a 1995 revival. Now Adam Davies, who says the character of Jimmy Porter made him the actor he is today, has stepped into Jimmy’s shoes. At first it seemed Davies would fall far short of expectations. In order to render Jimmy’s sheer hatefulness and malevolence believable, as well as his more sensitive moments sympathetic, an actor is required to provide a blistering performance. Without that, the play fails. During the first half, Davies’ machine gun delivery threatened to ruin the nuances of Osborne’s lines. Ends of passages were lost, pauses ignored. However, by the second act Davies had Jimmy nailed. The audience drew its breath when he unleashed his invective, and willed him on to the final scene. Jimmy is the plum role but Java Bere as the long-suffering Alison Porter was mesmerising. Alison may have married Jimmy in an act of rebellion but the character’s journey from unblemished middle-class girl to broken soul is effortlessly revealed by Bere. And the rest of the actors rarely put a foot wrong. Look Back in Anger has long been cast as a play about class values and intellectual war. Blackhand Productions has forced this reviewer to see it differently: as a treatise on the pain of being alive. Osborne gifts a redemptive ending to an emotionally-exhausted audience, but it’s a redemption which leaves a sour taste in the mouth. 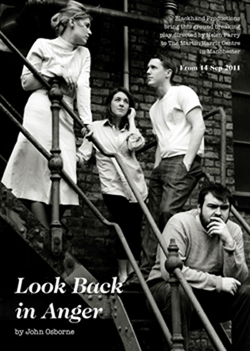 Look Back in Anger was at The John Thaw Studio Theatre at The Martin Harris Centre, The University of Manchester.